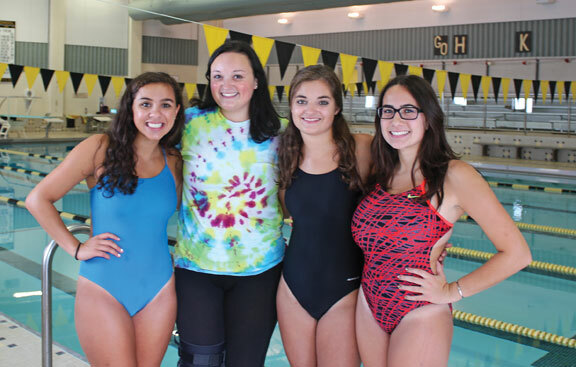 BEACON FALLS — The Hawks have made strides in the pool the past two seasons. In 2014, Woodland finished 7-6 finish and seventh at the NVL championships. Last year, Woodland improved to 8-4 and took fifth place finish at the league championship meet. Head coach Mike Magas, who is in his 13th year patrolling the pool deck, has high hopes for this year’s Hawks and is looking for that improvement to continue. Diving coach Doug Mariano, who gets the most out of the diving team, and new assistant coach Charles Ostradner, who had plenty of success during his years swimming for the Hawks, will be by Magas’s side this year. The Hawks will be led by captains Taylor Amore, Tatianna Lynn, Olivia Rua and Veronica Dergachev. Dergachev will be leading from the pool deck as she suffered a season-ending injury. Woodland lost eight swimmers to graduation, but have a strong group of underclassmen, including nine freshman, to keep improving. “We did lose some talented athletes from last season,” Magas said. “The good thing is we got a strong group coming in with nine new freshman that I’ve coached at the middle school level. Juniors Kyla Drewry and Brooke Pope finished in the top ten at last year’s NVLs as part of the 200 medley relay, 200 freestyle relay and the 400 freestyle relay. Seniors Lynn and Dergachev were also part of two of those relay teams. Woodland outscored the rest of the league in diving at the NVLs last year with 77 points, taking third, fifth and seventh place. Diving will be a strong suit for the Hawks again under the tutelage of Mariano. Junior divers Julianna Bartolucci and first-year diver junior Brianna Bachelada will lead the Hawks on the diving board. Juniors Jordan Williams, Carly Erickson, Jordan Theroux, Maia Rosario, Morgan McSherry, Madison Hoxie and Zarina Garcia add to the Hawk’s depth. Sophomore Natalie Katrenya leads a talented group of younger swimmers who will look to make an impact as well including freshmen Casey Brooks, Aly Rojco, Morgan Swift, Camille Terrell, Grace Rua, Victoria Gugliotti, Lauren Avery, Miaraid Reilly and Mia Carranza. Woodland will also look to get a strong boost from junior Dia Gawronski, who transferred fro Cheshire Academy and can swim in any event. “Before the season is through you are going to hear an awful lot about her as she is an excellent swimmer,” Magas said. The Hawks open the season Sept. 14 when they host Jonathon Law of Milford at 4 p.m.